A growing number of bird rescue, placement, and sanctuary organizations are facing the challenge of caring for displaced parrots. Many traditional shelters and animal control organizations are also gaining the knowledge and skills to provide suitable care and placement for the rising numbers of unwanted or abused exotic birds entering their facilities. All of these organizations can use volunteers and donations to help birds in their care. 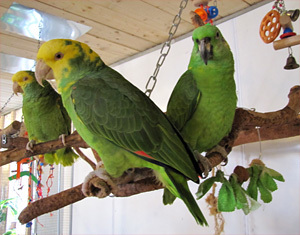 Flocking with Friends at Foster Parrots, Ltd. Taking Flight! 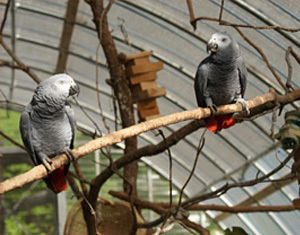 African Grey Parrots at Central VA Parrot Sanctuary. See the YouTube here. Some groups claim to be rescue or sanctuary facilities, but in reality are animal collectors or hobby breeders that simply formed a nonprofit organization and promote themselves as a refuge for birds. Others even breed the birds they rescue to fund their rescue or place them into breeding situations. Many unwanted birds also fall victim to “hoarders” who warehouse them in grossly substandard conditions while others acquire them to use for entertainment in roadside zoos or to peddle at bird marts, auctions, or over the internet. Don’t be fooled! Before donating, do your research to ensure that your support is going to a genuine avian shelter, placement, or sanctuary organization. Avian rescue and shelter organizations in the U.S. and abroad range from small, home based rescue groups that provide temporary care and placement for birds in need to large sanctuaries that provide lifetime care for hundreds of birds. The quality of animal care, ethics, organizational management, education and advocacy are among the factors to be considered. Regardless of their differences in size, location, or available resources, certain qualities are universal among ethical avian rescue organizations. Professional Management – It takes more than good intentions to run a professional and sustainable nonprofit avian shelter organization. Taking in large numbers of birds-especially long-lived species like macaws and cockatoos-without sufficient resources can easily overwhelm an avian care facility’s ability to provide proper care, and conditions can quickly deteriorate. Look for organizations with sound infrastructure, solid management, and a funding plan that will enable them to succeed long-term. They should comply with all federal, state, and legal requirements governing nonprofit organizations, have an active, independent board of directors without conflicts of interest, and offer transparency relating to their mission, animal care, and funding practices. Advocacy and Collaboration - Bona fide rescue and sanctuary organizations also stand against practices that contribute to the suffering and exploitation of animals. They support social and legislative policies that will increase protections for birds in captivity and in the wild. They also work in partnership with other avian and animal protection groups to help ensure that birds everywhere are afforded quality care and humane treatment. Education – An effective program that focuses on the facts, promotes a better understanding of the true needs of birds, and offers solutions to the complex issues involved in addressing their welfare. Most importantly, the organization’s stance should be clear - all birds belong in their rightful place in the wild. Public Outreach – Parrots are curious, intelligent, and fascinating creatures. Their highly emotional nature and repertoire of behaviors are often entertaining to humans. But as amusing as their antics may be, reputable groups refrain from exploiting them for profit or self-aggrandizement. Be wary of groups that use birds to perform tricks or hire out birds for entertainment, commercial purposes, or purely for exhibition. These practices are typical of commercial entities that profit from animals and are in contrast to the ethical standards of nonprofit animal rescue and sanctuary organizations incorporated to provide refuge and protect animals in their care. Integrity - Reputable groups do not promote the commercial trade in birds, nor do they breed them or place them in breeding situations. 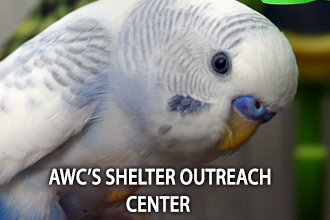 AWC contributes to several initiatives aimed at improving standards of care for captive birds. • Avian Shelter Outreach – Educational resources to help animal sheltering facilities care for captive exotic birds in a shelter environment. Visit our Shelter Resource Center. • USDA Regulations – Provided extensive recommendations for proposed regulations to protect birds not bred for research under the Animal Welfare Act. • AWC board members worked with nationally and internationally recognized leaders in the animal protection field to help found The Global Federation of Animal Sanctuaries, an accrediting organization formed to help strengthen and support the work of legitimate animal sanctuaries worldwide. Volunteer or donate your time to parrot welfare or start your own captive bird rescue, placement, or sanctuary organization. Click here. All material Copyright © 2002–2018 Avian Welfare Coalition, unless otherwise noted. Contact us to request reprint permission.